Now that winter has passed, it’s a great time to decorate your windows with some trendy spring window fashions. The spring season can be reflected in your home simply by changing up colors, fabrics, and accessorizing your windows. By switching from those dark colors and heavy fabrics from the winter season to lighter colors and lightweight fabrics, it will feel like spring in your home instantly. 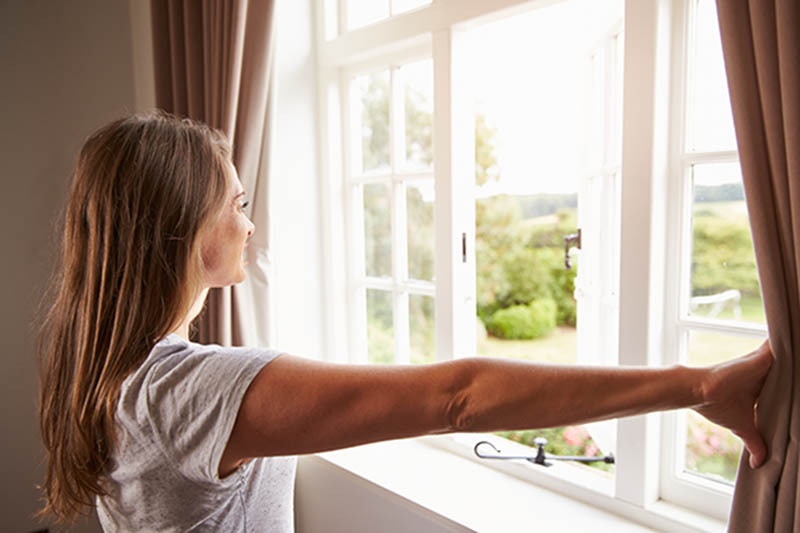 If you are trying to brighten up your space, here are some tips on how to bring the latest spring window fashions into your home. Say goodbye to those dark, dull colored curtains from the winter and say hello to some bright, fun colors for the springtime. Adding a touch of color to your windows will immediately catch your eye and make them look complete. Consider incorporating multiple colors when purchasing curtains such as bright colors, pastels, and patterns to give the window a more contemporary design. Keep it simple and don’t overdo it, or the curtains can draw your eyes the other way. Using bright colors in your window treatments will give the room a stylish and lively appearance. Bright colors never go out of style in window treatments and always make a statement in any room. Consider using a pop of hot pink or bright orange to draw attention to the space. Bright yellow curtains are also a great option to bring warmth into the room and will create a welcoming space. While you’re at it, consider matching living room or bedroom furniture such as bedspreads or throw pillows to the color of your window treatments to complement each other. When choosing to use pastel colors to decorate a home, the overall mood can tend to be more relaxed. But don’t worry, pastels can be used beautifully in any window treatment, as long as they are not over used. By adding a little pop of pastel in any window treatments, it will give the room more of a soft, warm vibe. This will suit your windows perfectly for the spring season as you should consider using colors such as light blues, pinks, and yellows that will give more of a spring appearance to the space. Instead of sticking with solid, simple colors, switch it up with some fun springtime patterns to give dimension to your windows. Consider floral prints, geometric patterns, and other trendy spring window fashions. This makes the window stand out and creates a dramatic focal point for your eyes to draw to. Incorporating a subtle pop of pattern in your window treatments can also make your simple furniture stand out and look more put together. If you are looking to update your window treatments for the spring, consider sheer curtains. Sheers are easy to style on any type of window and provide a lightweight, breezy feel in the room. Decorating your windows with sheers add minimal texture and color to any room, but always look modern. Consider looking into white or light colored sheers for the spring months, as it will give off a crisp, clean touch to the room. To give more dimension, alternate with white and another light colored sheer to provide more of a visual appeal to the windows. Another tip is to swag the sheers to the side and tie them with a ribbon or tieback to hold them in place. Tiebacks come in many different assortments like glass, metals, ceramic, or fabric to gather them together neatly. Pick whichever suits your style best and it will look complete in no time. When adding silk curtain panels to any room, it will instantly give off a feminine vibe. This will create more of an elegant, sophisticated look for the spring and make the space look luxurious. Consider using lighter colors for this time of year, since dark colors can darken up the room and keep the light out. Whether you like short or long paneled curtains, either one will look great as long as you keep the fabric colors light. Do you feel like your windows are a little underdressed for the springtime? Don’t fret! Consider pairing different types of curtains with different colors, textures, and patterns to make your windows look complete for spring. Layering bright colors and patterns will make the room feel more modern and brighten up the space overall. 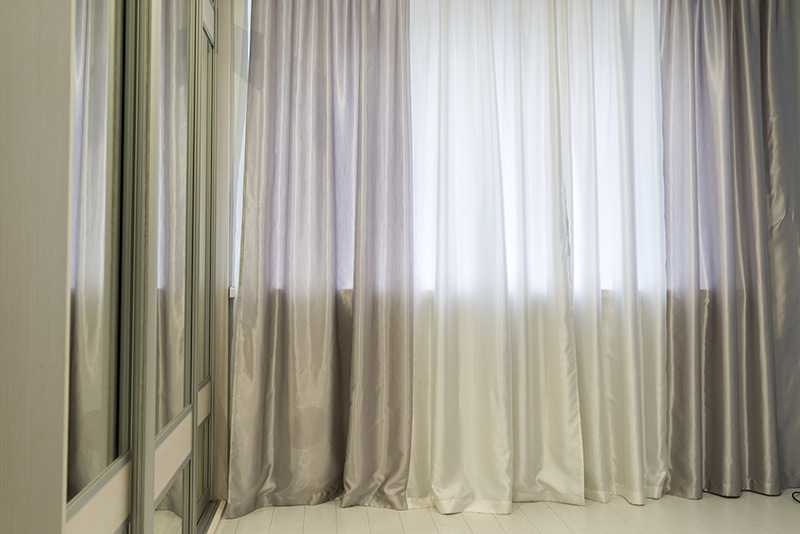 Pairing sheer and opaque curtains together will allow for light to peek through during the day, and at night the opaque curtains will keep light out. By layering different fabrics, it creates versatility in the room and becomes unique to your personal style. It only takes a few small changes in your window treatments to make the entire space stand out. Consider adding borders, trims, or tassels to create dimension in the window treatments. Current trendy window fashions such as fringe and frills will give more of a feminine, chic look to the room. You could also make a statement by adding metallic hardware to the window such as gold, silver, or bronze curtain rods, hooks, or other unique pieces to give the room a grand appearance. Using different accessories in your window treatments will create a custom look and create a finished look in your home. But remember, during the springtime you want to keep the space simple and clean, so don’t go too crazy with the accessories. Now that spring is finally here in Chicago, don’t you want to feel like you are outside enjoying the beautiful weather even when you are inside? Allow the shining sun to come through in your home as well. Another spring window fashion that never goes out of style is using window treatments that allow for a lot of light to peek through to brighten up the space. Consider using sheer, light colored fabrics such as sheer or linen curtains to still add a pop of color to the room, but keep it light so natural light can still show through. Make your windows stand out in your home by incorporating these fun, stylish spring window fashion ideas. Adding pops of spring colors, textures, and patterns to your current window treatments will enhance the room’s design and give a refreshed spring look to your home overall. It is a great way to enjoy the new season and also have a change of scenery in your home for the spring. If you’re in a spring decorating mood, you should check out our article about spring door decorations.